It was an incredible experience to meet people on backroads in Arizona. We had the opportunity to have a short “Navajo Conversation”! We were driving down highway 89 near Page, Arizona when we saw a pull-off for a small canyon. While there, we had a fascinating conversation with a Navajo woman who touched our hearts deeply. She was busy finding just the right beads and seeds in her square wooden box for a piece of jewelry she was making. We began talking and she was gracious and kind enough to let us video her as we asked questions about the Navajo Reservation. The Navajo Nation has a land base of 27,000 square miles and extends into Arizona, New Mexico, and Utah. The Reservation is roughly the size of West Virginia. 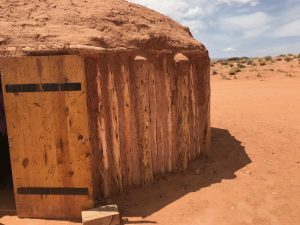 The Navajo Reservation is the largest in the U.S. The Navajo Nation has a population of over 300,000 and established a tribal government in1923. Many on the reservation Stu and I visited, still live in hogans-male and female hogans-depending upon the ceremonies being performed. Trey, our Horseshoe Bend Canyon tour guide, told us his grandparents lived in a hogan for 42 years which the family just dismantled a week ago. Trey took us inside a hogan his family rebuilt a couple of weekends ago. The principle of 4 is prevalent in Navajo lore and the hogan had four main timbers (they were pine with huge cedar logs higher).. The hogan has a fireplace in the middle of the dirt floor for cooking and heat. The Gila appeared, crawled up Trey’s arm and rested its head on his shoulder. They prayed together. When Trey holds a crystal now in his hand and looks into a fire, he has an out-of-body experience and can clearly see the fire and Gila standing with him. Trey was scared the first few times he experienced this phenomenon but recognizes the great power he has which requires him to think only good of everyone and to live a clean life.